Galicia, Spain’s northwest region, in the 1950s. After a childhood in exile, two sisters return to their grandfather’s cottage for the first time since his shocking murder during the civil war. 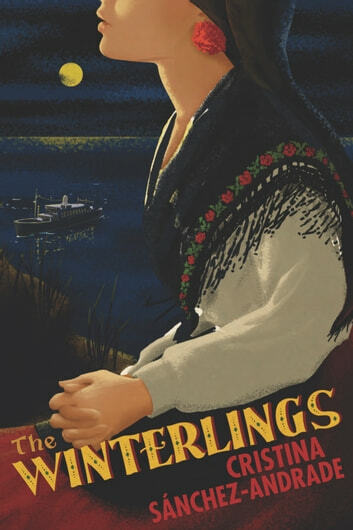 “The Winterlings” try to keep their dark secrets buried in Tierra de Chá, an idyllic village host to a cast of grotesque but charming characters: a powerful psychic, a woman who refuses to die and the obese priest who heaves up a steep hill each day to give her last rites, a cross-dressing dentist who plants the teeth of the deceased in his patients’ mouths. Tension mounts when the sisters, once united by their passion for Hollywood cinema, compete for the chance to stand in for Ava Gardner in the nearby filming of Pandora and the Flying Dutchman. Meanwhile, suspicion seeps in: Why have the women returned, and what are they hiding? What perverse business arrangement did the townspeople make with their grandfather, and why won’t they speak of his death? Cristina Sánchez-Andrade is the author of eight novels. She has won the Guadalajara International Book Fair’s prestigious Sor Juana Inés de la Cruz literary prize, and The Winterlings was a finalist for the Herralde Novel Prize in 2013. She lives in Madrid. Samuel Rutter is an Australian writer and translator. His translation of The Winterlings received a PEN Translates grant in 2015. He is a PhD candidate in Spanish at the University of Melbourne and is currently in the MFA in Creative Writing program at Vanderbilt University.